On this date in 1933, with the Reichstag (German parliament building) still smol­dering following the fire allegedly set by 24‑year-old Dutch Com­munist Marinus van der Lubbe the day before, German Chan­cellor Adolf Hitler per­suaded 87‑year-old Presi­dent Paul von Hinden­burg to sign the Reichs­tag Fire Edict. The emer­gency decree sus­pended key civil liberty sec­tions of Germany’s 13–year-old Wei­mar con­sti­tu­tion, among them the right to free expres­sion of opin­ion, including a free press, and free­dom of assem­bly and asso­ci­a­tion. The Reichs­tag Fire Edict abolished postal, tele­graph, and tele­phone privacy, and established the death penalty for an arm’s length of offenses, including arson, possessing fire­arms while opposing forces of the state, and assaults on the Presi­dent and members of his cabinet. A fateful misstep, the signa­ture of the ailing, senes­cent Hinden­burg quickly con­verted Germany from a par­lia­men­tary demo­cracy led by a would-be dic­ta­tor into an abso­lute total­i­tarian state headed by a chan­cellor with abso­lutely no alle­giance to democratic norms. It happened so fast—in less than a month. With parliamentary elections scheduled for March 5, five days away, Hitler, who had dissolved parlia­ment two days after being named chan­cellor on Janu­ary 30, ordered the arrests of thou­sands of opposi­tion Com­munists, including the party’s head, and rank and file Social Demo­crats, whose leader­ship had already fled to the safety of the Czech capital, Prague. Hitler’s para­military SA (Sturm­ab­teilung, or “Storm Detach­ment”) goons, nick­named “Brown­shirts,” wreaked havoc every­where they could, breaking into homes and busi­ness all across the coun­try and beating and tor­turing the vic­tims they dragged out and jailed. On March 5 Nazi organi­za­tions “moni­tored” polling places. Despite their best efforts to emascu­late, intimi­date, and chase off their polit­ical oppo­nents, the Nazis failed to gain an outright majority of the 39.6 mil­lion votes cast, garnering just under 44 per­cent to control 288 seats in the Reichs­tag. The strongest par­lia­men­tary party, the Nazis did not consti­tute the majority party: they needed the conser­vative German National People’s Party, which had 52 parlia­mentary seats as well as posts in Hitler’s coalition cabinet, to govern the country. To formally and legally place the whole power of government in his hands, Hitler on March 23 urged the Reichs­tag to enact and Hinden­burg to sign the Enabling Act (Ermaech­tigungs­gesetz). The act, known formally as the Law to Remedy the Distress of the People and the Nation, granted Hitler’s cabi­net the autho­rity to enact laws with­out the partic­i­pa­tion of the Reichs­tag or his coali­tion part­ners for the next four years. The Enabling Act, renewed by Reichs­tag members every four years during the Nazi period, went so far as to exempt laws enacted by Hitler’s cabi­net from being in compli­ance with the German (Weimar) consti­tu­tion! Thus using the tools of parlia­men­tary demo­cracy, Hitler gained unre­stricted free­dom to attack his legit­i­mate polit­ical rivals (mainly Socialists and Com­mu­nists) as well as Jews, ban all polit­ical parties except his own, and bully, ter­rorize, arrest, beat, imprison, torture, and kill any and all of his enemies, real or imagined. Above: Before the Reichstag burned: Joseph Ferdinand Klemm’s painting of the Ger­man Reichs­tag and the Bis­marck Memo­rial in the Koenigs­platz (“Square of the King”), Berlin, 1910. Based on evi­dence gathered in the after­math of the fire and more recently, the Reichs­tag arsonists were a 10‑member SA detach­ment operating under the orders of none other than Pres­i­dent of the Reichs­tag Hermann Goering. After the fire Reichs­tag members met in the Kroll Opera House (Kroll­oper), at the oppo­site end of Koenigs­platz, which is now a large grassy expanse called Platz der Republik (“Square of the Republic”). Both the Bismarck Memorial and Kroll Opera House are gone. 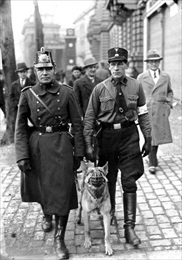 Left: Tasked with keeping peace and order on election day, March 5, 1933, a Berlin police­man and a Nazi SS (Schutz­staffel) Hilfs­polizist (auxil­iary police­man; literally, “help­ful police­man”) walk the streets of the capi­tal. These March elec­tions were the last freely contested elec­tions held until the col­lapse of Hitler’s Third Reich in May 1945. Between early March and mid-July 1933, Hitler banned all poli­ti­cal par­ties except his own Nazi Party, formalizing the ban on July 14 by promul­gating a law making the Nazi Party the only legally permitted party in the country. 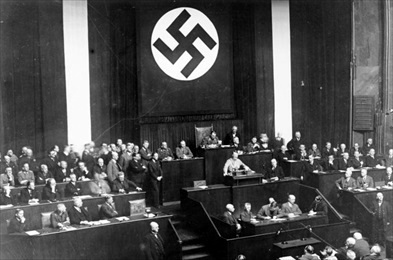 Right: Hitler addressing Reichstag members prior to their “dis­em­powering” them­selves by passing the En­abling Act on March 23, 1933. In part because Hitler’s Brown­shirts swarmed inside and out­side the Reichstag cham­ber, the bill met little resis­tance. The final vote was 444 supporting the Enabling Act to 94 opposed (all center-left Social Demo­crats). By then the Com­munist Party (the third largest party in the March 5 elec­tions) had been banned and 26 SPD (Social Demo­crat) depu­ties had been arrested or were in hiding. From that date on, the defanged Reichs­tag only met inter­mit­tently until the end of the war, held no debates, enacted few laws, and mainly served as a stage for Hitler’s set piece speeches. Since 1992 a memo­rial to 96 Reichs­tag members murdered by the Nazis between 1933 and 1945 has a place of promi­nence next to the rebuilt Reichs­tag. The murdered members were chiefly Com­munists (42) and Socialists (40), and their murders took place in concen­tra­tion camps such as Sachsen­hausen (11), Buchen­wald (8), Bergen-Belsen (7), Dachau (7), Ravens­brueck (4), and Mauthausen (4), to name the better known camps.